This feed covers public safety entities in Decatur, AL. The monitored entities include Decatur Police Department, Decatur Fire Department (dispatch only at this time), Decatur Utilities operations (very useful during emergencies such as accidents or weather) and the Morgan County Sheriff Department. The Morgan County EDACS trunked system is also scanned which allows monitoring of Decatur Fire Department, Decatur EMS, Trinity and Pricevile PDs. Talk-groups for Decatur PD and HEAR (ambulance to hospital communications) are locked out but all other TGs are available although the entities listed above are about all I hear on the system. Listen to the Decatur/Morgan County Public Safety Feed via your favorite media player at RadioReference.com: http://www.radioreference.com/apps/audio/?feedId=2994 or right in your browser below. The bottom shelf is spare parts (radios/antennas/power supply) and an uninterruptible power supply. The server is an Intel D410PT Mini-ITX motherboard with an Atom processor at 1.6 GHz with 1.5GB of DDR2 RAM and a 160GB 2.5" SATA hard disk. It is mounted in an embedded type case and mounted at the top of the wall in our den. 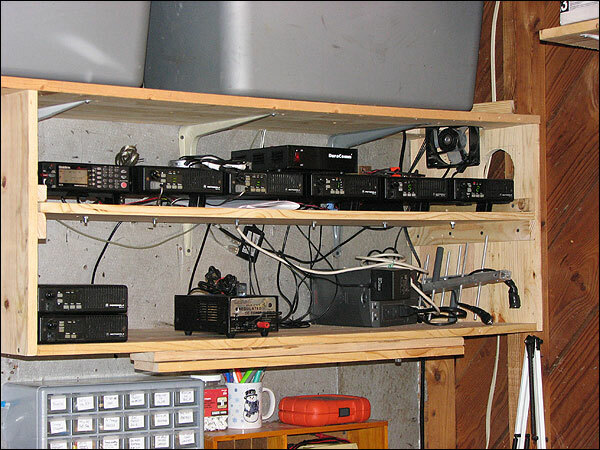 The opposite side of this wall is in the garage where the radio equipment is located. The power and USB wiring (for the Griffin iMic USB sound cards) runs through two small holes hidden behind the crown moulding. 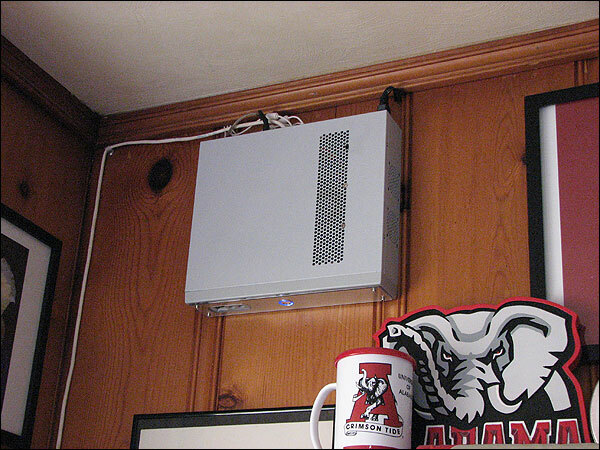 The cable running along the wall is Ethernet. Here is a "fall-ish" shot of some of the antennas. They are mounted on 30' of Rohn 20 type tower. 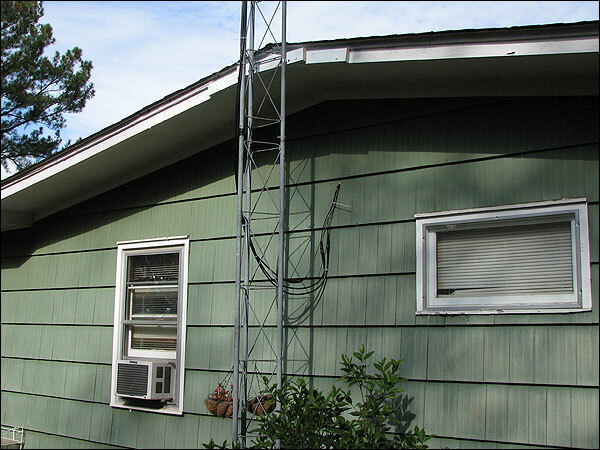 With a 10' pole installed at the top of the tower, the base of the top antenna is at about 37' above the ground. The top antenna is a dual-band VHF/UHF Jetstream JTB1 that is used for the Decatur/Morgan County Public Safety Feed as well as the railroad audio feed. Here is another shot of the antennas at the top of the tower. 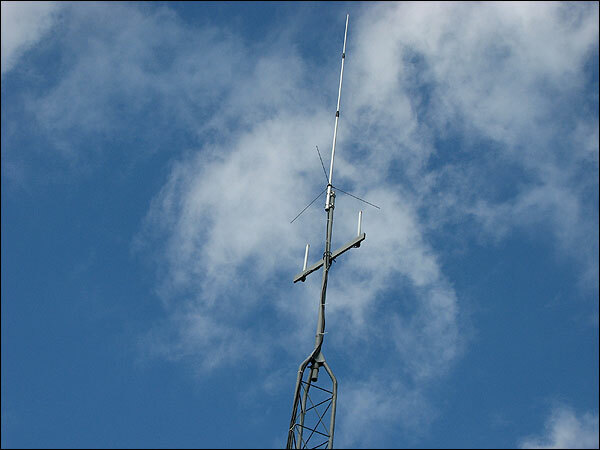 The two antennas below the dual-bander are a pair of Antenex FG8963 omni-directional antennas in a co-phased configuration spaced 2 wave-lengths apart. These are used for ATCS monitoring. 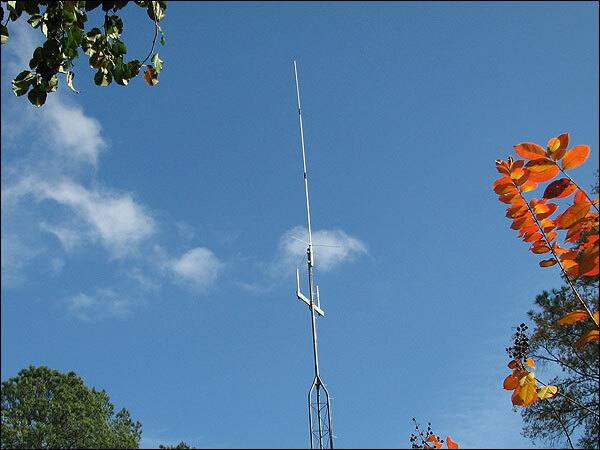 At about 15' above the ground is this Celwave PD10108-2 yagi. 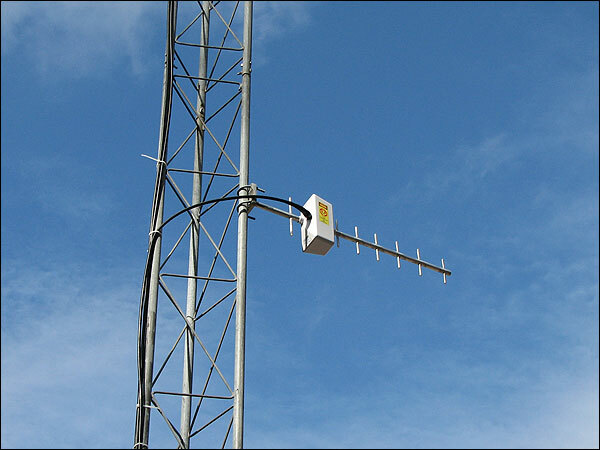 This antenna is also used for ATCS monitoring. Interested in running your own live audio stream on the Internet? Check out the new tutorial on setting up your own live scanner feed on the Internet!